This is a beautiful village, sometimes described as an oasis in the wild countryside all around. Here Glendalough Lake, the woods, the river and Lissoughter Mountain combine to form a delightful picture, best seen from the top of the mountain, which is readily ascended via the Connemara Green Marble quarries. Recess, set among superb lake and mountain scenery, is one of the choicest beauty spots of Connemara. On one side is Glendalough Lake and on the other Derryclare Lough. North of Derryclare, Lough Inagh stretches along the glaciated valley of Glen Inagh, separating the Twelve Bens from the Maamturk Mountains. Inagh Valley has excellent views of the two mountain ranges, with their remarkable conical shapes, can be obtained from this valley. The fact that they rise almost directly to over 600 m in a valley only 30 m above sea level, without any intervening hills, give them an appearance of most impressive height. A drive through the valley affords beautiful views of Derryclare Lake and Lough Inagh, and the scenery is further enhanced by afforestation on the foothills of the Twelve Bens. 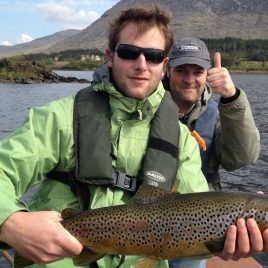 Lough Inagh is a famous game fishing lake and visitors are welcome. Boats can be hired locally.